This document is for our 2014 Approved Booths and Vendors. Please do not make a payment using the menu below without having prior written approval from the 2014 VegFest Houston Festival Committee. Congratulations Approved 2014 Festival Vendors! 1) DUE ASAP! Pay for your booth using the drop-down PayPal menu below. Be sure to select the appropriate pricing. Our 100% vegan vendors receive a discounted rate, which is listed below. Non-vegan vendors must select the appropriate payment rate. Please also note your company name in the PayPal comments section. Any booth being paid for after May 31 must pay the $25 late fee. Booth spaces will not be held without payment! No exceptions! No payments allowed after June 30, 2014 without special approval. After June 30, an additional RUSH fee will be added. 2) DUE BY JUNE 1, 2014! Liability Insurance required for all sales booths! If you are selling or sampling any items, you must have liability insurance. The only exemption is for a literature-only booth. You can also forward your Proof of Liability Insurance to VegFestHouston@vegansocietyofpeace.org. The venue name that should be listed as the Certificate Holder is: VegFest Houston, c/o Pershing Middle School, 3838 Blue Bonnet Blvd, Houston, TX 77025. We must have a copy of your Certificate of Liability Insurance in our binder at the festival. Sales and Sample booths will not be allowed to set up without this document being emailed to us in advance! If you need to purchase 1-day event Liability Insurance for the festival, please visit Total Event Insurance for a special VegFest Houston rate. 3) DUE BY JULY 1, 2014! Permit required for all Food booths! If serving or sampling any consumables (including vitamins), beverages or food of any kind, you must obtain a 1-day Temporary Food Establishment Permit from the City of Houston. The City of Houston Health Department will inspect all booths. Please visit the City of Houston Temporary Food Establishment Office here for applicant details and fees. Permits must be obtained from the City of Houston at least 7 business days prior to any event, so plan accordingly. (You must apply no later than July 9!) No booths serving food will be allowed to set up without this document! Please submit a scanned copy to your VegFest Houston Committee contact via email or forward to VegFestHouston@vegansocietyofpeace.org. You must display your original City of Houston Temporary Food Establishment Permit at all times from your booth. We will also keep a copy in our binder at the festival. 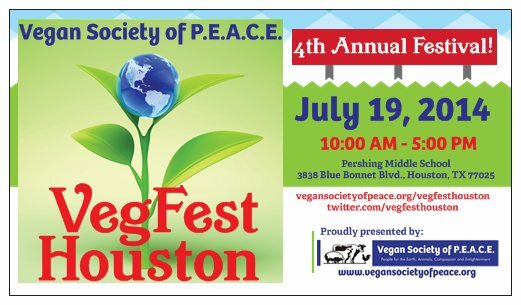 VegFest Houston © Vegan Society of P.E.A.C.E.